Liberty’s Aidan Kenley congratulates Ethan Donelson (12) after Donelson found the back of the net in the first half of Tuesday’s Division I, Region 1 semifinal against visiting Olentangy. 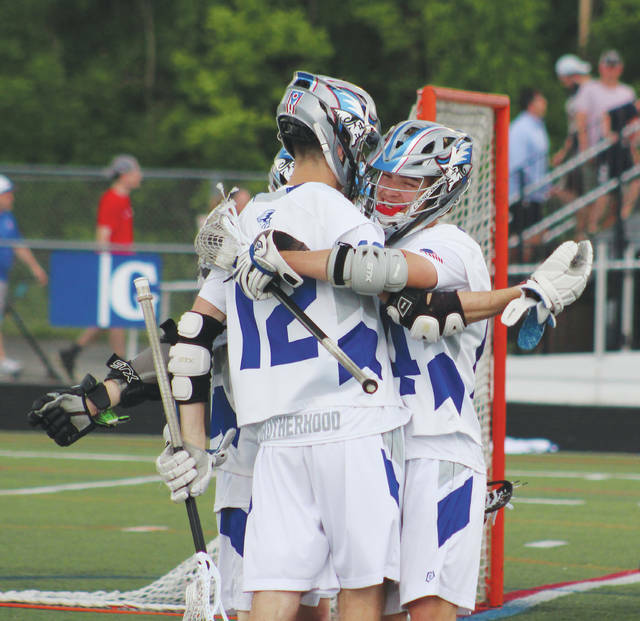 Senior Spencer Towne scored twice during a 4-goal run in the fourth quarter to create separation for the host Olentangy Liberty boys lacrosse team in a 13-10 win over rival Olentangy in a Division I, Region 1 semifinal Tuesday night in Powell. Towne had four goals and an assist, John Paolo and Alex Theuerkauf each tallied a hat trick and a pair of helpers and Skylar Wahlund had five saves to lead the second-seeded Patriots in the win. Johnny Wiseman’s goal with 4:33 left in the third quarter gave the Patriots the lead for good and Ethan Donelson found Paolo 30 seconds later to push the lead to 9-7. Josh Petrone came up with the ensuing face-off near the Liberty goal and found Blake Profio to cut the deficit to 9-8 with 3:49 left for Olentangy, which beat Liberty 12-11 May 1. The Patriots held the 9-8 lead through the end of the frame. Wahlund scooped a groundball in front of his own net and found Gabe Meyer to start a breakout. Meyer then found Paolo on the right side, who centered to Towne in front for the goal that started the 4-0 rally that put the game out of reach for the Patriots (14-6). Kyle Milliron had two goals and an assist and Blake Profio added a pair of goals as third-seeded Olentangy built a 5-3 lead with 10:37 left in the first half. But, Liberty responded with goals by Donelson and Paolo to tie it up. The teams were knotted in a 6-6 tie at the break. Milliron and Profio had three goals apiece, Milliron and Khairi Sears had a pair of helpers apiece and Charley Harkin stopped seven shots in goal to lead Olentangy (16-4). Liberty meets top-seeded Dublin Coffman in the regional final Friday at 7 p.m. at Otterbein.